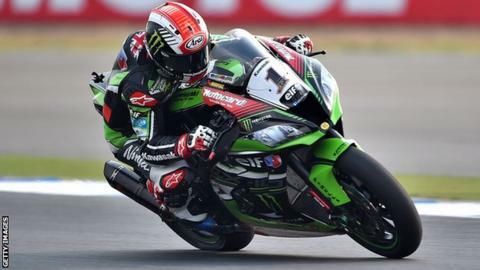 Jonathan Rea extended his lead at the top of the World Superbike series to 31 points by winning a thrilling first race of the weekend at Assen. Defending champion Rea came out on top over nearest championship challenger, Ducati-mounted Welshman Chaz Davies. Dutchman Michael van der Mark was also vying for the lead but crashed with two laps remaining, leaving his Honda team-mate Nicky Hayden to finish third. Kawasaki rider Rea has brought his career tally of Assen wins to eight. The Northern Irishman is the second most successful rider of all time at the famous 4.542km Netherlands circuit, now lying just four behind Carl Fogarty's record of 12 World Superbike successes. "I really enjoyed that race. I picked my moment, went through and managed to hold onto my lead," said Rea. "It's an important win for me as my confidence was dropping a bit, but this has really picked me up. The data we have learnt from that race will be invaluable." Rea, 29, led in the early stages before Davies hit the front, with former World Supersport champion Van der Mark also enjoying a spell at the head of the field in a four-way scrap for the lead in the latter stages. Rea extended his lead in the latter stages to secure a fourth consecutive win at Assen, his fourth success of this season, and a 33rd triumph of his World Superbike career. The second race will take place on Sunday at 12:00 BST. Assen is playing host to a round of the global series for the 25th time.